Year February 21 is the 52nd day of the year in the Gregorian calendar. There are 313 days remaining until the end of the year (314 in leap years). 1862 The Battle of Valverde was fought near Fort Craig in New Mexico Territory. 1874 The Oakland Daily Tribune published its first edition. The Oakland Daily Tribune was founded February 21, 1874, by George Staniford and Benet A. Dewes. It was first printed at 468 Ninth Street, Oakland, California as a 4-page, 3-column newspaper, in a 6-inch by 10-inch format. Staniford, the editor, and Dewes, the printer, gave out copies of the newspaper free of charge. The first issue contained news stories and 43 advertisements. The Tribune was sold several times and eventually became a major paper under William Edward Dargie, who acquired the paper July 24, 1876. Dargie was an innovator in the news industry in several ways. In 1876, wire service dispatches were added. In 1877, a book and job department was added. In 1878, when the Bell Telephone System arrived in Oakland, one of the first telephones was installed at the Tribune: Number 46. In 1883, a Saturday edition was introduced, in 1887, special editions were introduced, and in 1888, an extra for the presidential election. On August 28, 1891, the name Oakland Tribune was officially adopted. The Tribune was a charter member of the Associated Press upon its founding in 1900. Also in 1900, the Tribune hired Jack Gunin, the first full-time photojournalist in the Western United States. Early in 1906, the Tribune printed a Sunday edition, making it a full seven-day newspaper. The San Francisco earthquake and fire of April 18, 1906 destroyed all the newspapers in San Francisco. The Tribune printed many extra editions. Dargie lent the Tribune’s presses for a joint edition of the San Francisco Examiner-Chronicle-Call. In the aftermath of the earthquake, San Francisco Mayor Eugene E. Schmitz, declared the Oakland Tribune the official newspaper of San Francisco. On September 1, 1950, with the demise of its competitor, William Randolph Hearst’s Oakland Post Enquirer, the Tribune became Oakland’s only daily newspaper. The Tribune won a Pulitzer Prize for a photograph of a small private plane narrowly missing a B-29 Superfortress in 1950, and another for photographs of the aftermath of the October 17, 1989, Loma Prieta earthquake. Born today: Jeanne Calment (February 21, 1875–August 4, 1997), French super-centenarian. Lived 122 years, 164 days. 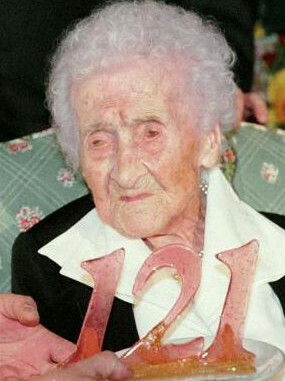 Jeanne Louise Calment, French pronunciation /ʒan lwiz kalmɑ̃/, was a French super-centenarian who had the longest confirmed human lifespan on record, living to the age of 122 years, 164 days. She lived in Arles, France for her entire life, outliving both her daughter and grandson by several decades. Calment became especially well known from the age of 113, when the centenary of Vincent van Gogh’s visit brought reporters to Arles. In 1896, at the age of 21, she married her double second cousin, Fernand Nicolas Calment, a wealthy store owner. Their paternal grandfathers were brothers and their paternal grandmothers were sisters. His wealth made it possible for Calment never to have to work; instead she led a leisured lifestyle, pursuing hobbies such as tennis, cycling, swimming, rollerskating, piano, and opera. Fernand died in 1942 at the age of 73. Their only child, a daughter named Yvonne Marie Nicolle Calment (January 20, 1898–January 19, 1934), produced a grandson, Frédéric Billiot (December 23, 1926–August 13, 1963). Yvonne died one day before her 36th birthday from pneumonia, after which Calment raised Frédéric herself. Frédéric became a doctor, but died at age 36 in an automobile accident. In 1965, at age 90 and with no heirs, Calment signed a deal to sell her apartment to lawyer André-François Raffray, on a contingency contract. Raffray, then aged 47 years, agreed to pay her a monthly sum of 2,500 francs until she died. Raffray ended up paying Calment the equivalent of more than $180,000, which was more than double the apartment’s value. After Raffray’s death from cancer at the age of 77, in 1995, his widow continued the payments until Calment’s death. During all these years, Calment used to say to them that she “competed with Methuselah”. Calment recalled selling colored pencils to Van Gogh and seeing the Eiffel Tower being built. At the age of 114, she appeared briefly in the 1990 film Vincent et moi (Vincent and Me) as herself, becoming the oldest actress ever to appear in a motion picture. In 1988, at age 113, Calment was given the Guinness title “World’s Oldest Living Person”. However, in 1989, the title was withdrawn and given to Carrie C. White of Florida, who claimed to have been born in 1874, although this has been discounted by subsequent census research. On White’s death on February 14, 1991, Calment, then a week shy of 116, became the oldest recognized living person. On October 17, 1995, Calment reached 120 years and 238 days to become the “Oldest Person Ever” according to Guinness, surpassing Shigechiyo Izumi of Japan, whose claim (120 years 237 days old at the time of his death on February 21, 1986, Calment’s 111th birthday) has since been discounted. Calment ascribed her longevity and relatively youthful appearance for her age to a diet rich in olive oil, which she also rubbed onto her skin, as well as a diet of port wine, and ate nearly one kilogram (2.2 lb) of chocolate every week. Calment smoked cigarettes from the age of 21 to 117 (1896 to 1992). Calment reportedly remained mentally intact until her very end. After Calment’s death, 116-year-old Marie-Louise Meilleur became the oldest recognized living person. 1885 The Washington Monument was dedicated. 1918 The last Carolina Parakeet died in captivity at the Cincinnati Zoo. 1925 The New Yorker published its first issue. 1937 Waldo Waterman’s Arrowbile, the first successful flying car, made its initial flight. 1951 Born today: Vince Welnick (February 21, 1951–June 2, 2006) American keyboardist with The Tubes and The Grateful Dead. In 1994, he was inducted into the Rock and Roll Hall of Fame as a member of The Grateful Dead. 1965 Malcolm X was assassinated by members of the Nation of Islam at the Audubon Ballroom in New York City. 1967 Died today: Charles Beaumont January 2, 1929–February 21, 1967) American writer, especially known for his episodes of The Twilight Zone. Beaumont wrote these episodes for The Twilight Zone: “Dead Man’s Shoes”, “Elegy”, “The Fugitive”, “The Howling Man”, “In His Image”, “The Jungle”, “Long Distance Call” (co-written with Bill Idelson), “Long Live Walter Jameson”, “Miniature”, “A Nice Place to Visit”, “Number 12 Looks Just Like You” (co-written with John Tomerlin), “Passage on the Lady Anne”, “Perchance to Dream”, “Person or Persons Unknown”, “The Prime Mover” (story by George Clayton Johnson), “Printer’s Devil”, “Shadow Play”, “Static” (story by O. Cee Rich), and “Valley of the Shadow”. The episodes “Living Doll”, “The New Exhibit”, and “Queen of the Nile” were ghostwritten by Jerry Sohl, but credited to Beaumont. 1971 The Convention on Psychotropic Substances was signed at Vienna. 1972 The Soviet unmanned spaceship Luna 20 landed on the Moon. 1976 The inaugural Winter Paralympic Games opened in Örnsköldsvik, Sweden. 1995 Steve Fossett landed in Leader, Saskatchewan, Canada becoming the first person to make a solo flight across the Pacific Ocean in a balloon.